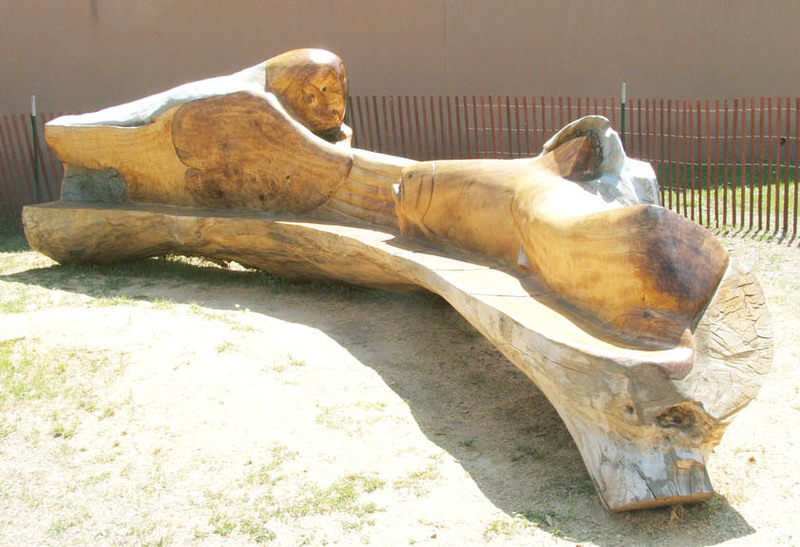 THE BENCH HAS MOVED TO THE PARK!!! 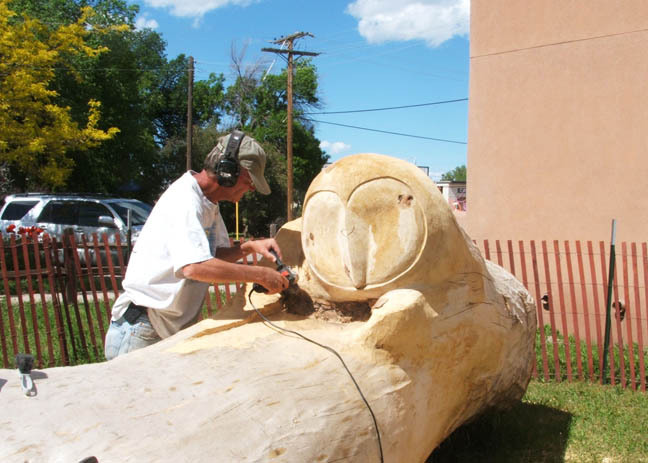 A collaboration of the La Veta School of the Arts and the Spanish Peaks Arts Council for a Public Works Art Project. 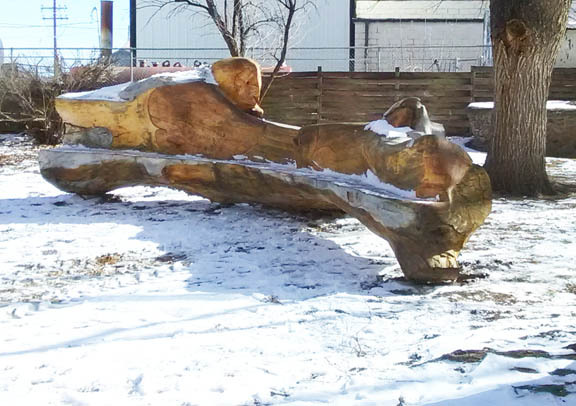 January 24, 2018, the crew from Blakely Construction in La Veta moved the finished bench from the La Veta School of the Arts to the La Veta Town Park. It is situated on the northeast end of the park. The location of the bench was determined based on the anticipated construction of a performing stage in the park behind the Town Hall. The vision of the stage includes a grassy, bermed area for people to sit and enjoy performances. The vision also includes the placement of the bricks that were sold to raise the funds to move the bench, incorporating the bricks around the stage and the bench. We appreciate the patience of all those who contributed by purchasing personalized bricks and will be working with the Town on where to place the bricks. 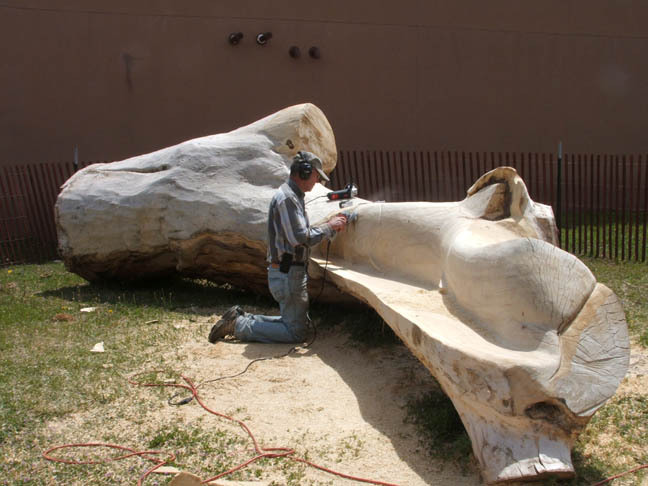 Local woodcarver and surgeon Dale Gillan was selected by representatives of LVSA and SPACe to transform a massive cottonwood log into an artistic bench for La Veta. 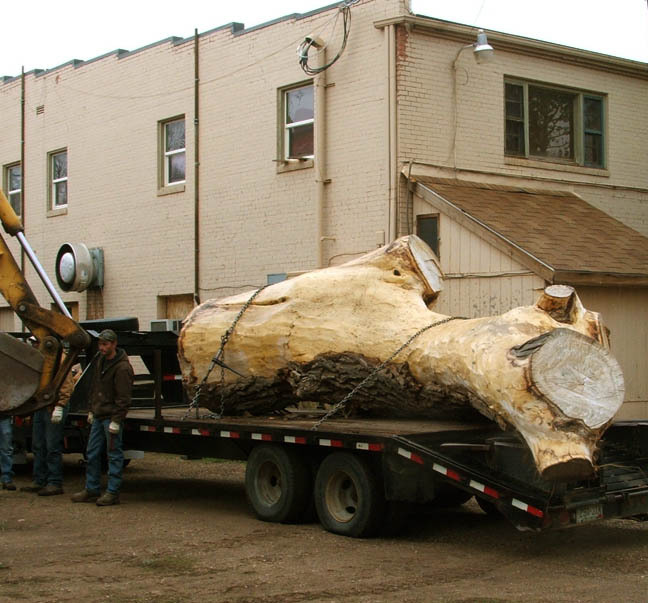 Th e log was transported to the courtyard of the La Veta School of the Arts April 16, 2015 by Robert Ingoldby of RAI enterprises (The Tree Guy) with his son Dustin, and Town of La Veta employees Chris and Tom Knowles, and Shannon Shrout . Dr. Gillan worked on the piece at that location most of the summer, completing the sculpture Aug. 20, 2015. 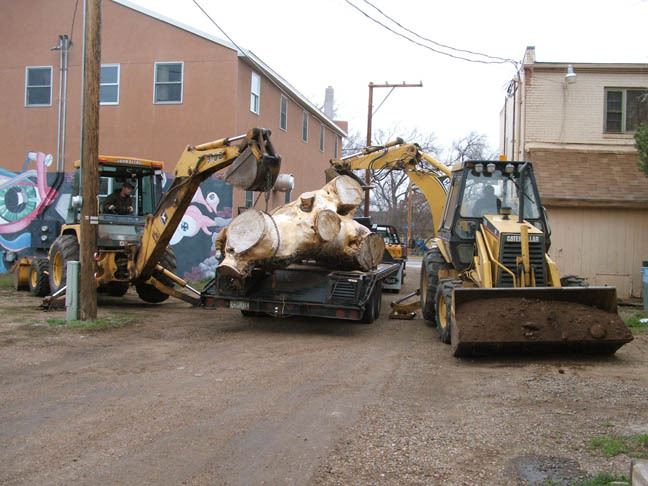 Robert Ingoldby of RAI enterprises (The Tree Guy) with his son Dustin, donated time and materials together with Town of La Veta employees Chris and Tom Knowles, and Shannon Shrout and Town equipment. 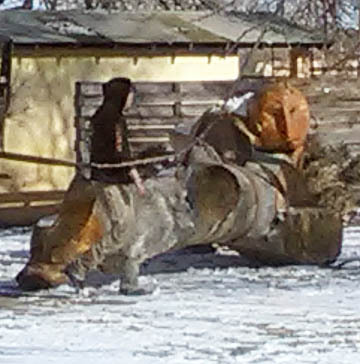 It was a chilly day in April when this difficult task was accomplished. 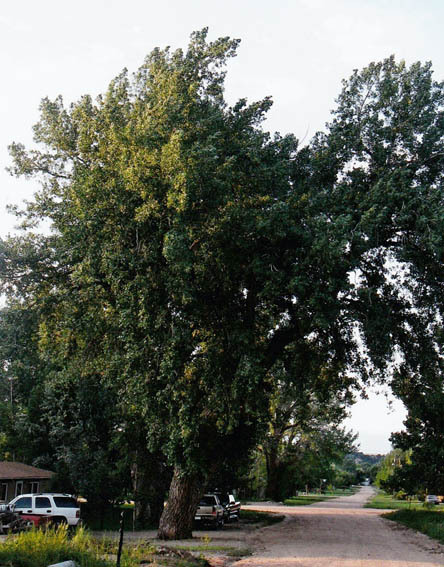 The elderly Cottonwood tree was cut down in Sept. 2013 to improve drainage on Poplar St. in La Veta. 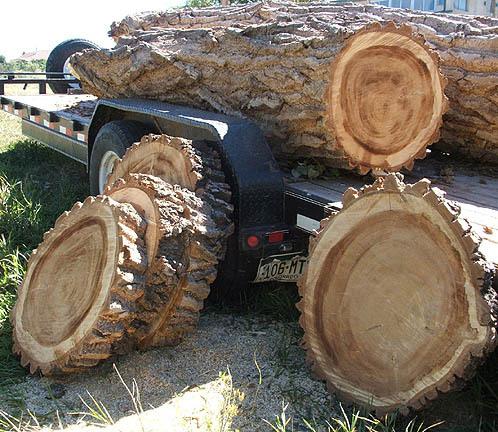 Large rounds were donated to the public by SPACe at Octoberfest . 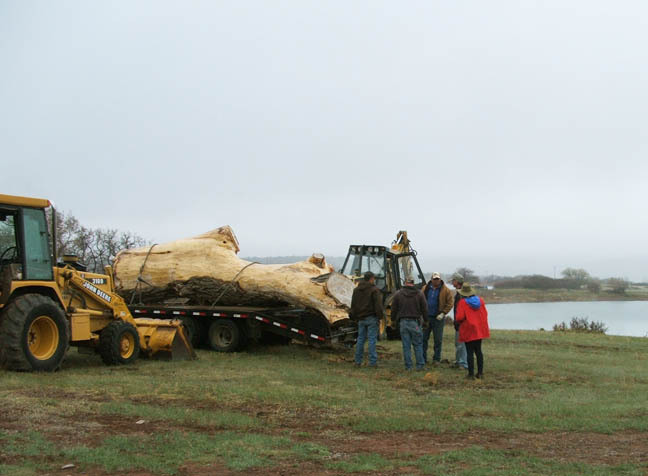 The log rested at the Town Lakes for 18 months before volunteers began removing bark in preparation for carving. 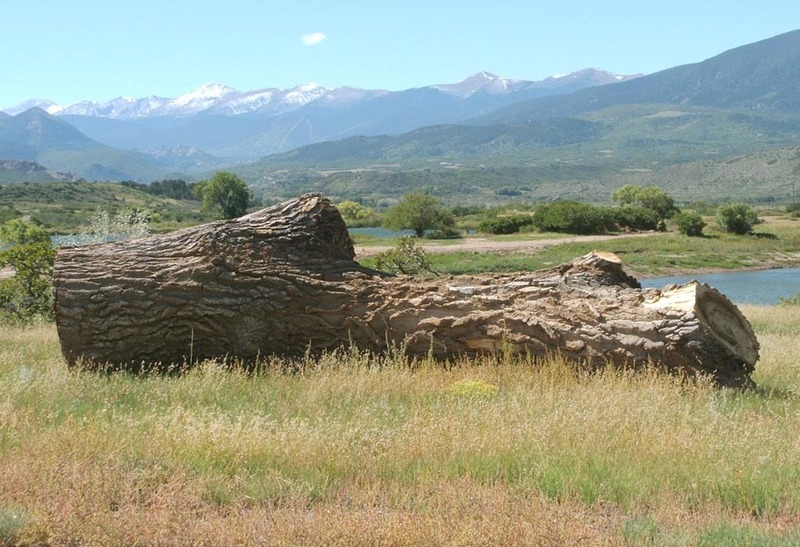 The Town of La Veta arranged, at no cost to SPACe, to transport the base of the tree to the Town Lakes so it could live on as a work of art. 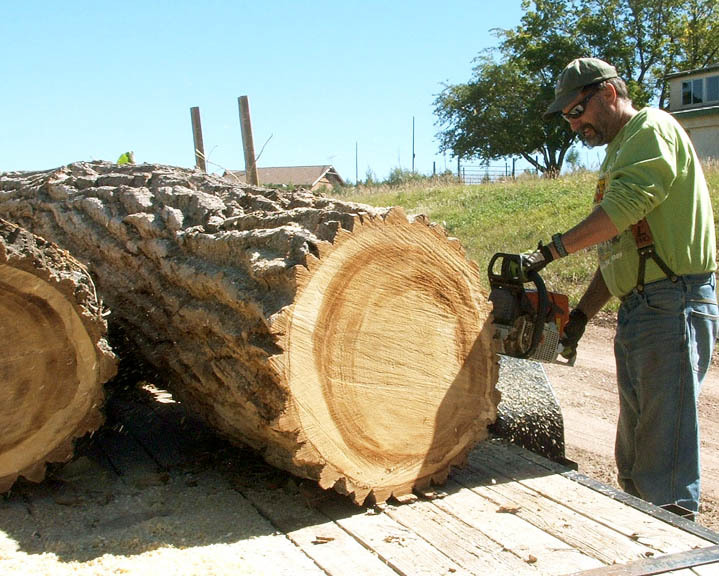 Colorado State Forest Service forester Mark Loveall volunteered his skills and cut several large rounds from other parts of the tree, which SPACe gave to visitors at Octoberfest 2013. 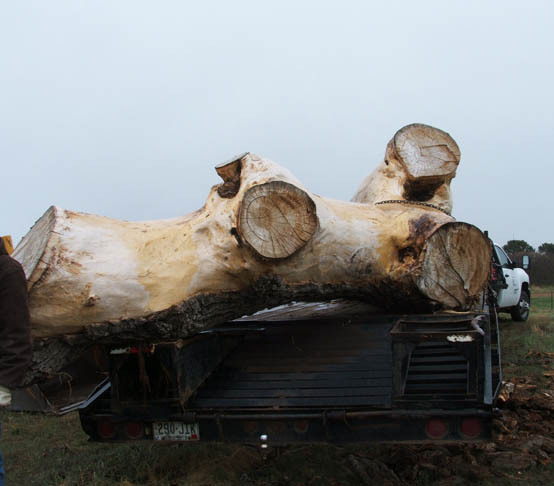 Recipients of the large pieces of the tree were asked to create something either beautiful or useful with the rounds and to share them with the community at the Botanica art show the following spring. 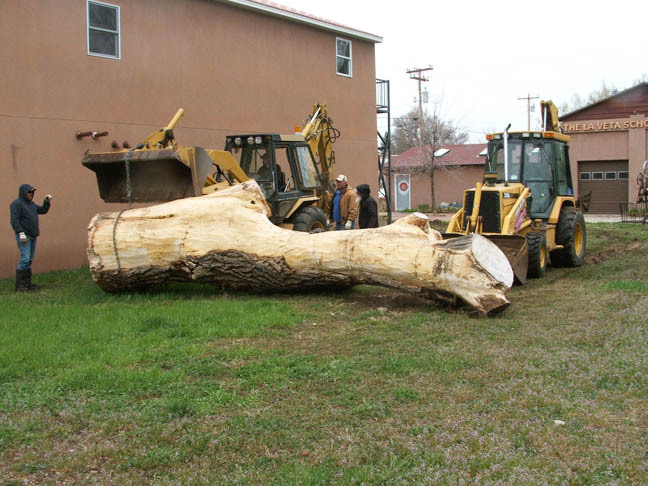 Smaller pieces of the tree were also distributed with the help of numerous volunteers. 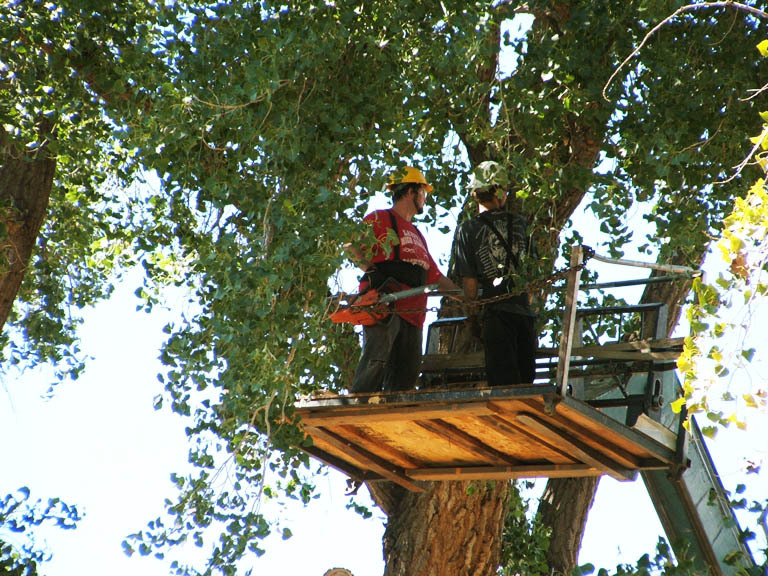 A committee comprised of volunteers from LVSA and SPACe has been working to make this project happen. 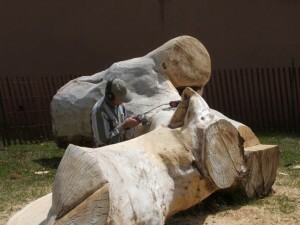 Donations are needed to complete the project. Donate to either SPACe or LVSA. 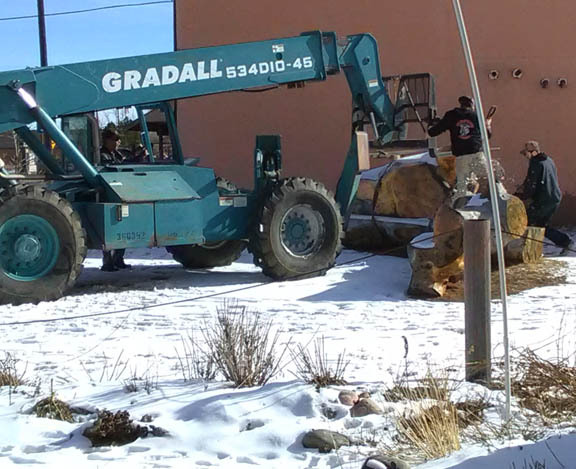 Buy a brick with your name – to show your support of the arts in La Veta. In order to raise funds for this project, bricks with donors’ names are being given in exchange for donations of $50 or $100. 4″x8″ bricks are $50 and 8″x8″ bricks are $100. Donations may be made through either SPACe or LVSA. For more information go to That’s My Brick. 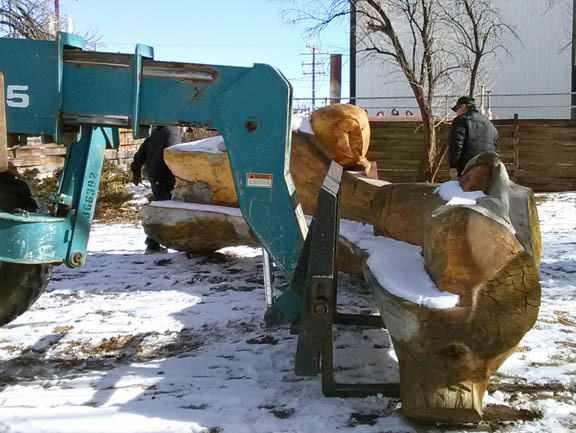 The bricks will be placed around the base of the bench when it is moved to its final location. Like to donate but don’t want a brick? We’d love your support of this community project. 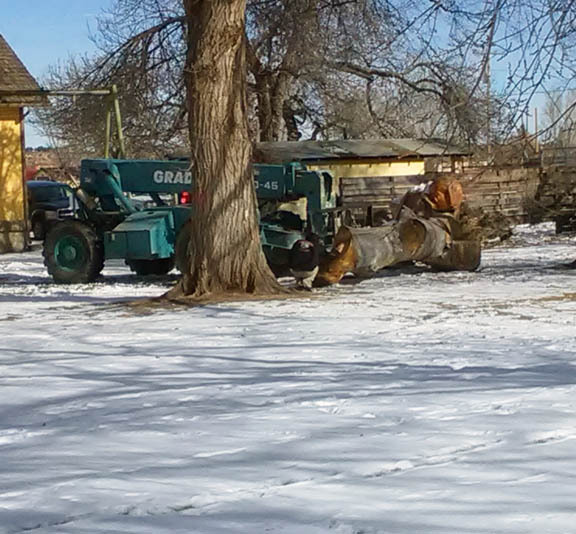 Send your contribution to SPACe, PO Box 803, La Veta, CO 81055. 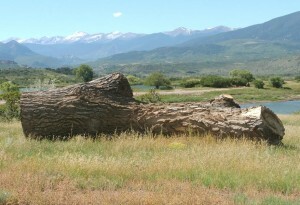 Please note “Cottonwood Bench” and be sure to include your return address.